I mentioned Common Resources earlier this week in reference to a fat well the company completed in San Augustine County, TX and wanted to give some more background on them. Unfortunately because the company is private, relatively little information is available. The company is a well funded private equity-backed start-up based in The Woodlands, TX. It was founded by Roger Jarvis, who previously founded and sold Spinnaker Exploration (here is an interesting article from a couple of years ago about the company). The company focuses on onshore gas properties with a bias towards horizontal drilling. 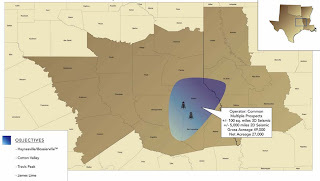 In the Haynesville Shale region (also targeting the various Bossiers, James Lime and Cotton Valley), the company has leased 27,000 net acres (49,000 gross), mostly in Texas, and plans to drill eight to ten wells in 2009. The company's overall capital budget for 2009 is $169 million. As noted in my earlier post, the San Augustine Co. well below was a big success.